The approach to Pinchot from the south is relatively easy. 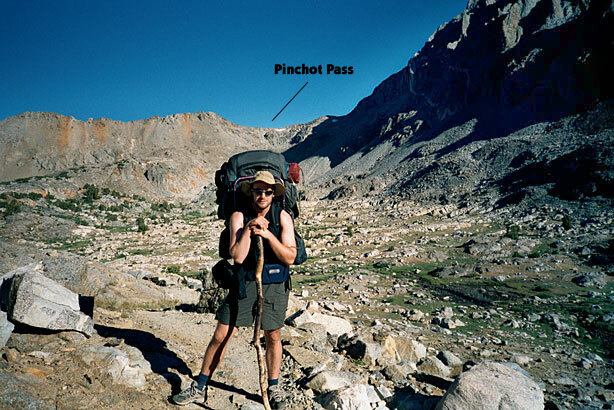 In fact, Pinchot is one of the more forgiving passes on the JMT. We got an early start and started north. The one important observation we made on the way up was that, though the trail wasn't too steep, last night's energy-poor freeze dried meal left us with little in the way of pass-bagging energy. Corn pasta, folks. That's the way to go. For some reason, I didn't record anything in my journal on this day. In the journal entry for August 9, I surmised, "It was cold, for one thing. In fact the morning found frost and ice on my backpack. 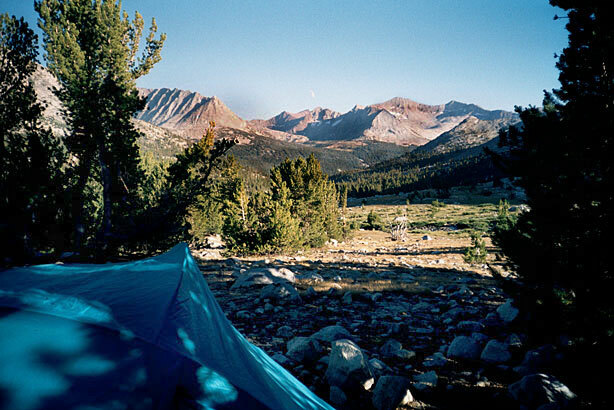 Maybe I was too jazzed to have found yet another great campsite. Or maybe I was just plain tired from braving Pinchot." But I did write reflect a little, so my journal writings here are culled from tomorrow's entry. 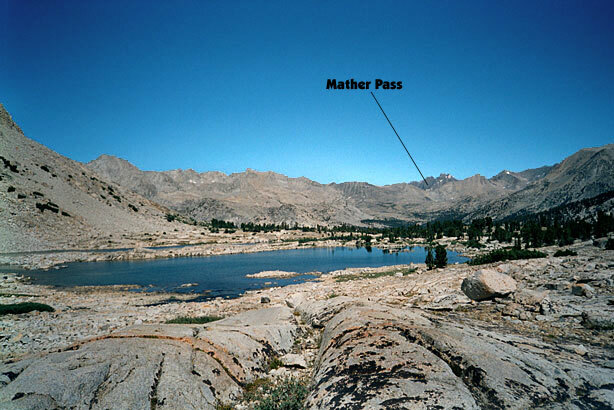 7:15 PM- We made it to within 2-3 miles of Mather Pass- high up in the Upper Basin. We started out at 7:30 this morning and saw no other hikers going our way. The trail was good, much of it flat, contouring around the mountain. 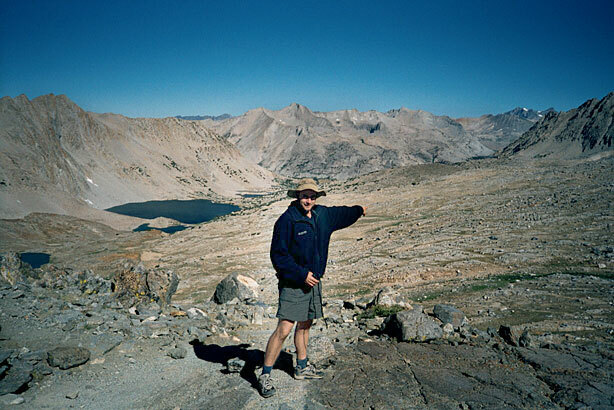 I topped Pinchot Pass at 9:30. We talked with another couple till 10:00, then went down to Lake Marjorie for a foot soak and sock change. 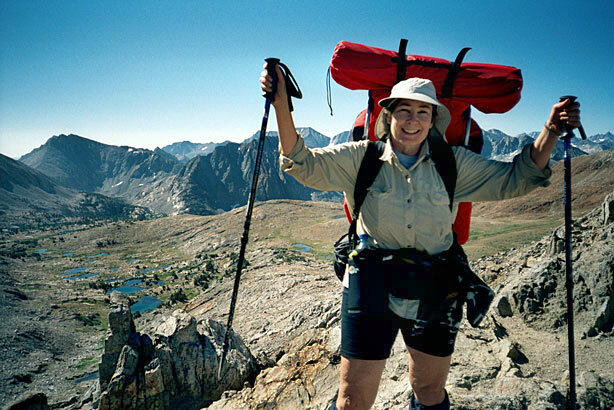 We descended from the summit of Pinchot, where we met a friendly couple on their way to Onion Valley (over Kearsarge Pass) from Florence Lake. We chatted for some time and then we went our separate ways. Our path took us down past Marjorie Lake into some of the finest alpine wonderlands we've seen yet. Past the Bench Lake trail and the Taboose Pass trail (and the talkative couple who were headed out that way) down to the South Fork of King's River. There, I came up with one of the best ideas I've had yet: ULTRA PEANUT BUTTER. Crunchy Jif, Soybean butter, honey and M&M's a fantastic addition to any plain ol' tortilla, dontcha know. 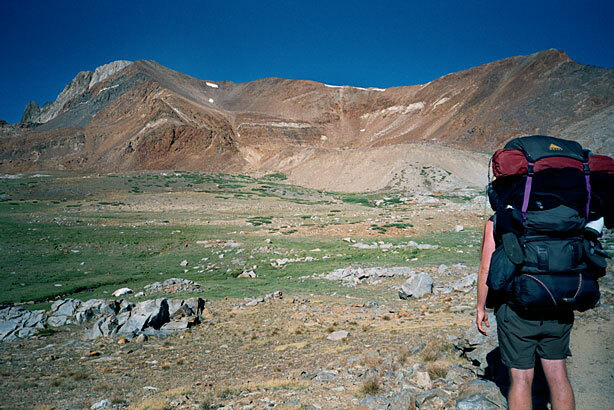 The climb toward Mather Pass through Upper Basin was warm and gentle. There, I think I had a perfect Sierra Moment. Open meadow, a nearby river, dense purple lupine, brilliant blue sky, a cooling breeze.and then the final touch: two butterflies floating by in the breeze. The kind you hear about in cheese-ball sentimental poems and saccharine greeting cards. Then down through the trees to 2 river crossings (So. Fork Kings River), then up the basin, a gradual climb. I wish I had a camera good enough to take pictures of the flowers. They were spectacular. 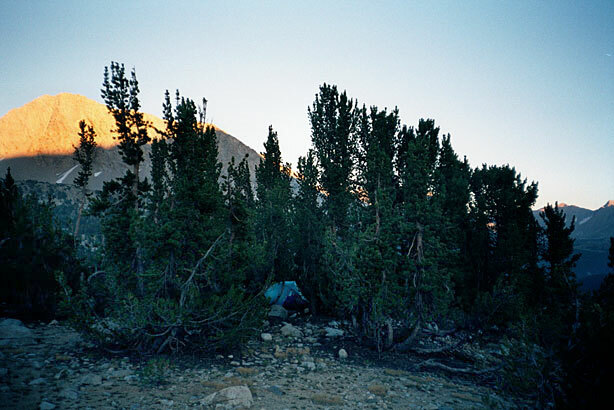 We found a campsite opposite Cardinal Mt. with a few trees and magnificent views to the South by 3:30. It was a beautiful day, so we relaxed and washed up by the river. 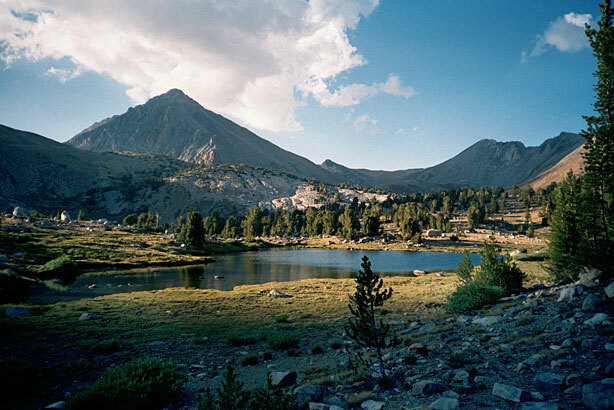 We camped near the "infant" South Fork, 3 miles shy of the crest of Mather Pass. The water coursing through that open bowl was so temperate, I was able to climb in and bathe. Stretched out on a warm, sunny rock, my clothes drying on the rocks around me, I would have been hard-pressed to imagine that hours later it would be below freezing. The wind is picking up now. It will be a chilly night, I think. Dinner of corn pasta with dehydrated zucchini and tomatoes, garlic, cheese, dry pesto sauce and cheesecake. Big day tomorrow. Another pass and lots of downhill. Ouch.